A model of a B-52G bomber plane from McCoy Air Force Base. The Boeing B-52 Stratofortress is a long range, heavy bomber that entered military service in 1955. The primary role and purpose of the B-52 was strategic bombing and nuclear deterrence; two roles that were essential for a Cold War bomber. From 1952 to 1962, Boeing Company produced 744 B-52s. Out of those 744 B-52s built, 193 were G models. In 1961, McCoy Air Force Base in Orlando, Florida, acquired the B-52. McCoy Air Force base was a key strategic base for the U.S. Air Force’s Strategic Air Command (SAC). SAC was in charge of all strategic bombers and intercontinental ballistic missiles within the continental United States. With the B-52 located at such a strategic Air Force base, it was capable of performing one of its main roles, nuclear deterrence. "B-52." Encyclopædia Britannica Research Starters, EBSCOhost (accessed January 28, 2016). http://eds.a.ebscohost.com/eds/detail/detail?sid=8e422c1d-95dd-40cf-b132-70355e932d0f%40sessionmgr4002&vid=2&hid=4103&bdata=JnNpdGU9ZWRzLWxpdmUmc2NvcGU9c2l0ZQ%3d%3d#AN=87994690&db=ers. Evans, John C. "Pinecastle / McCoy Air Force Base." Strategic-Air-Command.com. http://www.strategic-air-command.com/bases/McCoy_AFB.htm. "History." B52 Stratofortress Association. B-52 Stratofortress Association. http://www.stratofortress.org/history.htm. 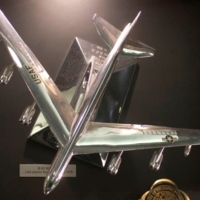 “B-52G Model from McCoy Air Force Base.” RICHES of Central Florida accessed April 19, 2019, https://richesmi.cah.ucf.edu/omeka/items/show/7893.